When inspiration hits and you have that sure-fire, guaranteed idea for a great business, what do you do next? How do you fire your boss and open your own successful enterprise? There is more involved than just ideas and theories. Launching a business is hard work and requires careful calculating steps. 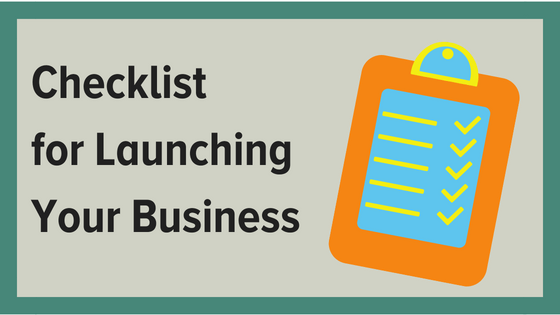 Keep reading for a basic checklist for launching your new business. Your idea must be capable of working and be appealing to a broad spectrum of possible clients. In other words, it must be viable. In order to find out, you must research your idea thoroughly. Your research should give you the information you need to either move forward with your idea, tweak it, or take it back to the drawing board. The type of information you need depends on the type of product or service you want to sell. Research will help you to ascertain a need for your idea, to determine a potential market, to size up the competition, and to test the usefulness of your product or service. In addition to the viability of your business idea, you must be viable as well. You must determine your own degree of entrepreneurial fitness. Do you have what it takes to be a successful entrepreneur? Do you have the spirit and work ethic necessary to do what it takes to succeed, without supervision or encouragement? And, what about financing and marketing? Do you have the wherewithal to finance your idea’s development, or the ability to secure sufficient financing? Do you have a plan for marketing your idea to the masses? You will likely need guidance from someone with experience launching new businesses. Your business plan is more than the idea which inspired you. It is a set of steps to follow in order to launch your business into reality. In the world of business, there are many steps to starting a legitimate, legal company. Choose Your Business Address – A real address lends credibility to your business. Whether or not you need an actual, physical location or a virtual space depends on your type of business and its needs. Obtain a Business Phone Number – A business phone number also lends credibility to your company, as well as making it easier to keep business and personal calls and expenses separate. Many options exist, including mobile lines. Create Your Business Identity – This includes the steps above as well as getting your business known among your target market. A name, logo, contact information, and other physical props like signage and business cards all let the world know your company exists. Register Your Business – Your business must be registered within your state as a legal business entity under a specific name, as well as with the IRS for tax purposes. Obtain a Business License and Necessary Permits – All businesses need some form of license or permit in order to operate legally. This often comes as a surprise to new business owners, especially online and home-based businesses. Apply for Your Employee Identification Number(EIN) – This is only necessary if you will have paid employees. Otherwise, you can simply use your social security number. Establish a Business Checking Account – Keeping your personal and company finances separate is crucial, and not just for tax purposes. If you set up your business as anything besides a sole-proprietorship, you need separate bank accounts for handling your money. Set Up Your Bookkeeping Process – Whether you take a QuickBooks class and do it all yourself or hire an accountant, you need a set process to account for your company finances. Obtain a DUNS Number – This is a unique nine-digit identifier for businesses, used to establish a D&B® business credit file. This is accessed by lenders and potential business partners to help predict the reliability and/or financial stability of your company in question. Establish Credit in Your Business Name – In addition to establishing the business identity factors above, you should open credit lines with vendors and obtain a business credit card. Pay all expenses on time from your business account. Establish a Website– In today’s global marketplace, a quality website for marketing and commerce is essential. Don’t skimp here; your website is most often the first impression a potential client sees when checking out your company. It can mean the difference between getting their business or losing it. Establish Business Social Media Accounts– Social media is a powerful medium for promoting your business and linking back to your website, and business accounts separate from your personal accounts can be used solely for company interests. Register with Online Business Directories– Many online directories exist to aid searchers with locating local businesses in certain industries. Register your company with several and be sure you are in the most applicable category that represents what your company provides. Of course, we’ve only scratched the surface here. Under each item above there are numerous questions to be answered. Many considerations must be taken into account. You will likely need guidance from someone with experience launching new businesses. We have the knowledge and experience necessary to guide your new company from the idea stage to the profit-making stage. We can handle such items as helping you craft a business plan, building your website, handling your social media accounts, lead generation, publishing, overseeing your entire marketing strategy, and more. Contact us today to get started.